Case Construction Equipment‘s TV450 compact track loader (CTL) is a 10,610-lb. (4,812 kg) vertical-lift machine with a rated operating capacity of 4,500 lbs. (2,041 kg) at 50 percent tipping load. The TV450 features 9,188 lbs. of breakout force, and optional high-flow (3,450 psi at 39.5 gpm) and enhanced high-flow (4,000 psi at 35 gpm) hydraulics for high-power attachments such as mulching heads, stump grinders and cold planers. The Case TV450 is available in either standard mechanical (H Pattern) controls, or optional electro-hydraulic controls (H and ISO pattern interchangeability), as well as optional mechanical hand and foot controls. Case electro-hydraulic controls — EZ-EH — provide adjustable speed and control sensitivity settings that can adjust to meet the needs of each application and attachment, and operators are able to switch between H and ISO patterns via a simple rocker switch. 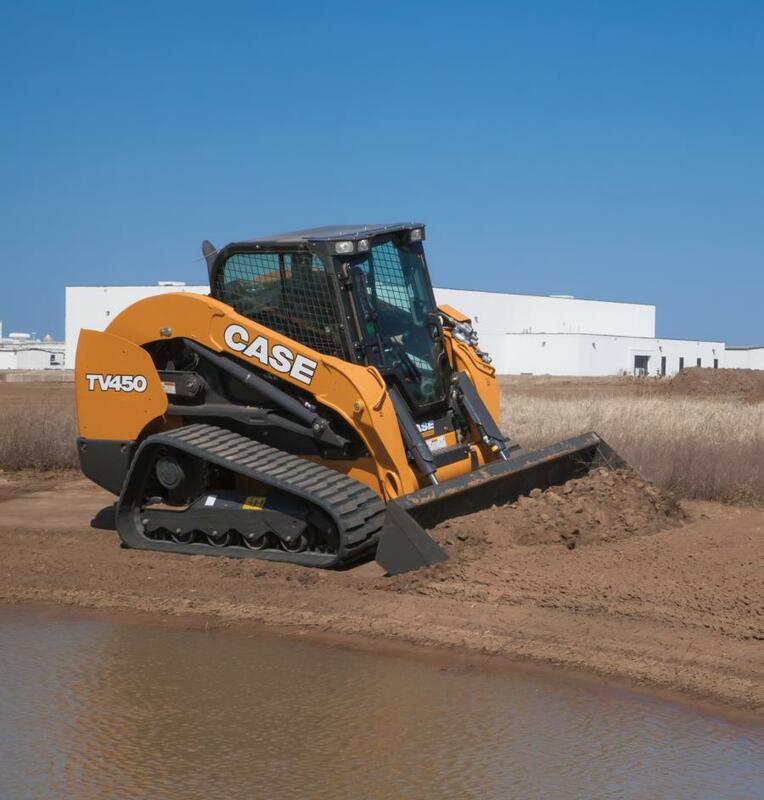 Case also has made a number of premium features standard on the new Case TV450, including hydraulic one-way self-leveling, and ride control for a smoother ride and greater material retention. The Case TV450 also comes standard with heavy-duty front and side lights, front cylinder guards, a heavy-duty rear door, remote oil and fuel filters, as well as debris ingression sealing to prevent material from entering the engine compartment. The loader retains the hallmark Case operating environment, with one of the industry’s widest cabs and lowest entry thresholds for easy access to the cab and greater visibility to the front of the machine. The cab-forward design provides 360-degree visibility and site lines down to the bucket edge. A large, rounded rear window delivers excellent rear visibility — and an all-new standard in-cab rear view mirror further improves operational awareness. The Case TV450 meets Tier IV Final emissions standards with a selective catalytic reduction (SCR) system that only requires diesel exhaust fluid — no maintenance or lifetime service related to diesel particulate filters is required. Operators can quickly access all routine service points, including the engine, filters, fill points, and all other service points through a single point of access at the rear of the machine. The compact track loader also offers Case’s easy-tilt cab for easy access to the drivetrain compartment, and features reinforced structures for enhanced machine durability and reliability to meet heavy working environments.